Recently there have been a couple of big announcements in the kids music world that further underscore the shifting of the tides with regard to streaming media. 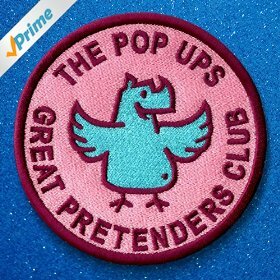 Spearheading the big news was the release of the Pop Ups’ latest album, Great Pretenders Club, which is being offered exclusively online through Amazon Music, along with music videos for each song. The second is Rhapsody’s launch of Rhapsody KIDS, a dedicated resource specifically targeting younger listeners and their families. As a someone who is professionally immersed in kids music what struck me about this new service is the impact that it could have for the genre as a whole. How this plays out financially for artists is another story, as small royalty payments and the loss of CD sales to streaming media continue to be sensitive topics. The thing that I find intriguing is the exposure potential that a dedicated kids music resource could offer, similar to the way Sirius XM’s Kids Place Live has made satellite radio a conduit for families to discover music together. While I recognize that exposure is in no way a substitute for the value of an artist’s time and craft, having a special “nook,” could add significant value through more focused research by dedicated music editors, and parent-child interaction. 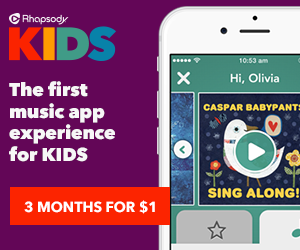 As the progression of kids music leans toward more of an all ages experience, where the sounds and quality of the lyrics are meant to appeal just as much to grownups, Rhapsody KIDS could open up a path toward a shared listening experience. As a parent I recognize the convenience of this service, and am eager to try it out with my daughter. As a music lover, and supporter of independent artists, I recognize that this is yet another avenue that discourages consumers from purchasing music, which is what puts more of a reward in artists’ hands. Hopefully over time the industry will shift and artists will start to earn more. A recent Newsweek article polled indie artists on their thoughts about streaming music and a few artists asserted that exposure through streaming services are attracting more attendance at live shows. Since the kids music genre is somewhat of a niche it’s hard to say if that same logic applies, but exclusive offers through digital outlets and featured kids music sections could sway things toward greater success. Chris Ballew of Caspar Babypants (and lead singer of The Presidents of the United States of America) is the featured artist in Rhapsody KIDS’ promotional video. Caspar Babypants is featured in promotional ads as well, alongside Kidz Bop and Disney. Offline Access – Save your data plan! Anything that’s bookmarked for kids automatically downloads for offline listening. Think dead spot on a local road, camping, or a dressing room in the mall. Just like Netflix Kids, though, Rhapsody KIDS seems to appeal to a broad range of ages so there will be a mix of styles together, i.e. Kidz Bop with Caspar Babypants, for example. So not all of it will necessarily be tolerable but unlike YouTube or Netflix, you won’t have to moderate for tween-age drama and dialogue. Our family still listens to our fair share of CDs, with streaming music a popular second and the radio third (50-50 between satellite and terrestrial). We are dedicated Netflix Kids users which has become a well worn resource and I plan on giving Rhapsody KIDS a whirl to see if it has the same effect. I will be reporting my thoughts back in a Kids Can Groove future post so stay tuned. My routine of unwinding for the day usually involves looking at social media. It’s a habit, and I get sucked right into it. The problem is that when I finally pull myself away from the screen, I still feel unsettled. I feel anxious and have a hard time falling to sleep. It’s a vicious cycle, and I see that it affects my daughter in the same way. If she is on the iPad for a certain amount she comes out of it agitated and off-kilter. The rush has ended yet our brains are still seeking input. To help with transitions, we’ve been winding down with softer music in the evenings, and a reading or drawing activity. Charity Kahn, the lead vocalist for the Bay Area group Charity and the JAMband, has been working to introduce mindfulness as a reliable resource to help others find relaxation and peace. Below Charity talks about her own practice as well as her recent project, “Sit Breathe Love: Guided Meditations for Children and their Grown-Ups” which offers guided practices to families, children, and schools. I have had a meditation practice for about eight years that has dramatically transformed and improved my life. About four years ago, I decided it was time to bring some of these principles and practices into my work with children and families. People of all ages are looking for relief from stress and way to calm down their bodies and minds, which mindfulness practice directly addresses. And children are incredibly receptive to the related concepts of kindness, gratitude, generosity and peace. No surprise there! Our most recent project in this vein is “Sit Breathe Love: Guided Meditations for Children and their Grown-Ups”. We’ve so far released three guided practices for families or classrooms under this umbrella to enjoy together: “Ball of Light Meditation”, “Mindfulness Experiment”, and “Meditation on Non-Harming”. Our plan is to release one per month. But it all started with the music. I had always integrated mindfulness themes like peace and love into my songwriting, but I took this intention more seriously as my practice deepened. Our most recent album, “Family Values”, is built around sixteen mindfulness-related concepts: lovingkindness, compassion, joy, equanimity, patience, understanding, generosity, community, intention, non-harming, gratitude, respect, mindfulness, waking up, truth, and peace. For example, there’s the “Lovingkindness” song — a sweet little singalong based on an ancient practice — that starts by sending goodwill to oneself (“may I be happy, healthy, safe and at peace”) and then extends these wishes for goodwill outward to others, and eventually to everyone, in all directions. Listen to the song. View the dance video (filmed by Peace Is The Way Films). There’s also the “Lemonade” song, a favorite at our concerts. This one is a rock epic that follows the adventures of a community of fairies living in a land called Lemonade. They are visited by an angry dragon who threatens to smite them and their land. Instead of resorting to fight, flight, or freeze, they end up using non-violence, compassion and generosity to solve the problem by making the dragon a special batch of their magical lemonade and bravely welcoming him into their community. Listen to the song. And then there’s the funky little “Grateful”, which explores some of the life experiences for which we have gratitude: the sun, the rain, our home, our school, our friends, and our family. This song includes musical performances by my kids (on trumpet and trombone) and my partner’s kids (on voice and piano)…it’s a family affair! 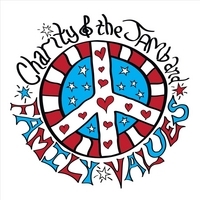 You can listen to the whole “Family Values” album here. 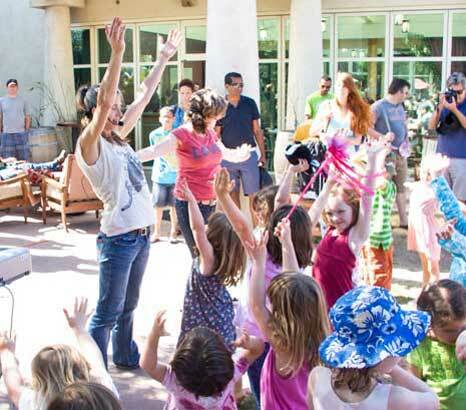 Since all of our music has accompanying choreography, there are dances that go along with these songs,and we sing and dance these themes with children all over the place — at our “Charity and the JAMband” family concerts, at my solo shows at libraries and schools around the Bay Area, at my JAMcamps for school-aged children, and in my early childhood music and movement classes, JAMboodas. I also practice mindfulness-inspired exercises with the children in my camps and classes, and with the families at my concerts. One of my favorites is Thich Nhat Hanh’s “Mindful Movements” — basically some simple yoga-like opening stretches that are done while staying connected with the breath. I’ve also written his Pebble Meditation practice into a song which has accompanying dance moves. I also share lovingkindness meditation, body scans, mindfulness of breathing, mindfulness of the body, mindfulness of emotions, mindful listening, mindful eating, mindful speech, and many other related practices as part of my programs. In parallel, I teach weekly Mindfulness Meditation classes for adults, and offer periodic workshops exploring Mindfulness practice and its intersection with various topics like relationships, stress, parenting, and joy. Some of these workshops are for adults only, some are for parents, some are for families. I have trained with Mindful Schools and combine their curriculum with my own to create a broad foundation of exposure for the children. I’ve also done retreats at Spirit Rock and the Insight Retreat Center, as well as training with Against the Stream, Insight SF, and IMC in Redwood City. For more information or if you’re interested in attending a concert, class, camp or other program, visit www.jamjamjam.com, or contact me at 415.425.0372 or charity@jamjamjam.com.